“Subodh, please run away, your luck's run out”. Image of art from the Subodh series. Used with permission. No one knows who painted it. Via Hobe ki's Facebook Page. 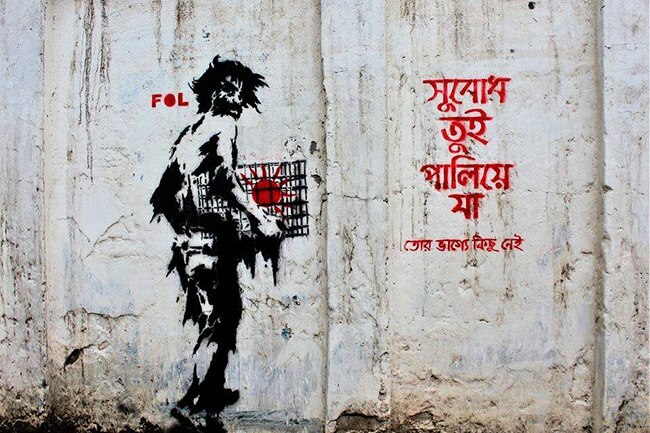 Similar graffiti emerged in a number of other areas of Dhaka in the months that followed. People started to share the images on Facebook and so they soon seemed to be everywhere. But nobody has said who might be painting the images and why. 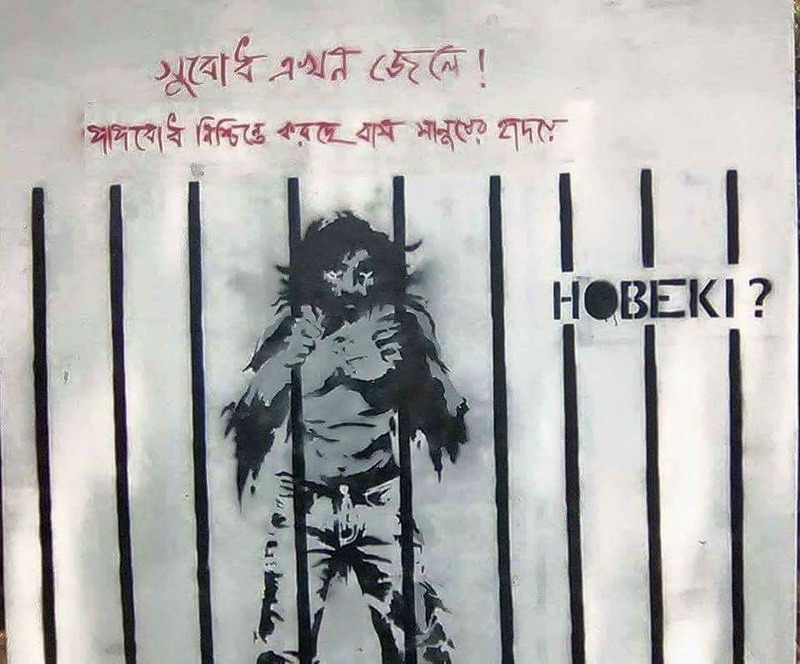 The artwork is signed off with another enigmatic message: Hobe ki? (Will it happen?). 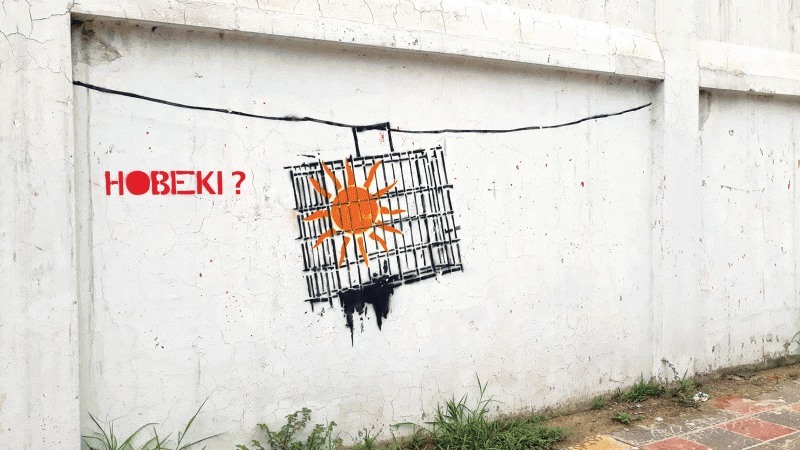 Many on social media are comparing the creator of the graffiti with Banksy, the famous (but anonymous) UK-based graffiti artist and political activist. The images were created using stencil graffiti and spray paint, a method well-known to Banksy. The ‘Subodh series’ also features political messages. I don't know who created this graffiti, maybe (we) will never know. Those who have grown up seeing Banksy's graffiti would surely appreciate the Subodh series. My love to the creator, whoever that may be. “Subodh, please run away. Time is not on your side”. Image of art from the Subodh series. Used with permission. Why does the creator of the graffiti want Subodh to run away? Many have contemplated that the artist may be trying to reflect on the social, economic and political crisis in the country. “Subodh is now in jail. A sense of guilt is residing inside people's hearts.” Image of art from the Subodh series. Used with permission. Is Subodh a victim of inter-communal strife? Subodh is a typically Hindu name. Hindus make up around 12% of the total population in Bangladesh. So naturally, some have been associating the artwork with discrimination against and harassment of minority Hindus in Bangladesh. Subodh, This is a country with (almost) 90% Muslims. Here religious right wingers like Shafi Hujur prevail with Fatwas (religious rulings) [Author's note: Bangladesh does not have Sharia law. But religious right wing parties try to impose Fatwas regarding many issues]. 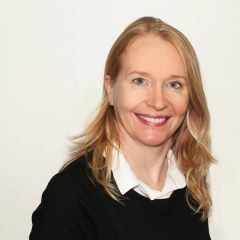 Rule of law, Lady Justice – why should you mourn all this? Please run away Subodh, your welfare depends on it. Renowned poet Shamshur Rahman once wrote a poem titled “Sudhanshu will not go” which touched on the issues of Hindu minorities migrating to neighboring India because of abuse by majority Muslims. Where are Rami, Shepu, Kakoli and our other dear friends? They have all left, now it's your turn. “Subodh please run away, time is not on your side. Humans have forgotten how to love.” Image of art from the Subodh series. Used with permission. “Subodh, please run away. Time is not on your side”. This Subodh is representative of Bangladesh at the present time. He is the representative of the unemployed and the marginalized people. He is the representative of good sense. He is the representative of other races and religions other than Muslim. He runs with a cage with a glowing sun trapped inside. I watch this and feel an overwhelming emotion, a fear for his future. 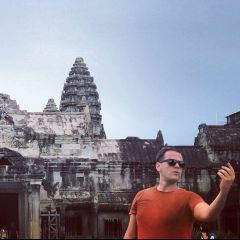 I say to myself “Run, baby run, Subodh please run away.” But where??????? Hobeki? (Will it happen?) – From the Subodh series graffiti. Used with permission. 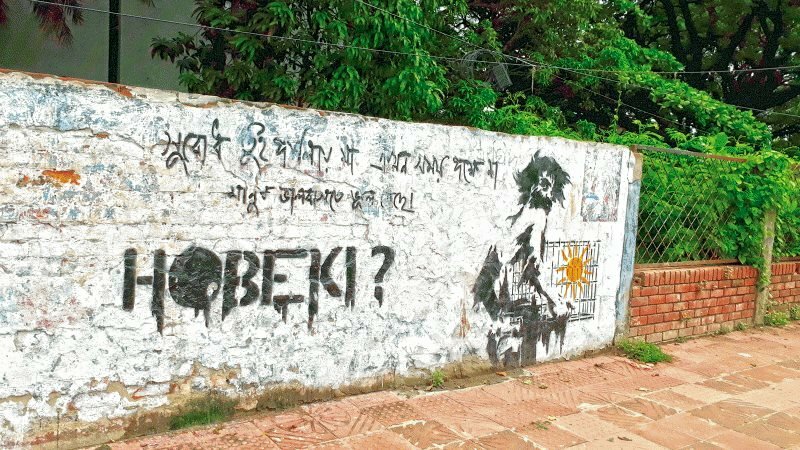 This is not the first time Dhaka has witnessed a spate of graffiti bearing a troubling but unexplained message. Shubodh is not a person; It is Shu-bodh, shu-chinta, shubho-chinta. 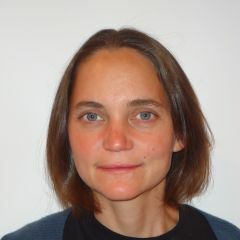 It is a concept; personification of good-thinking, good-intent, sense, reason, compassion, empathy. 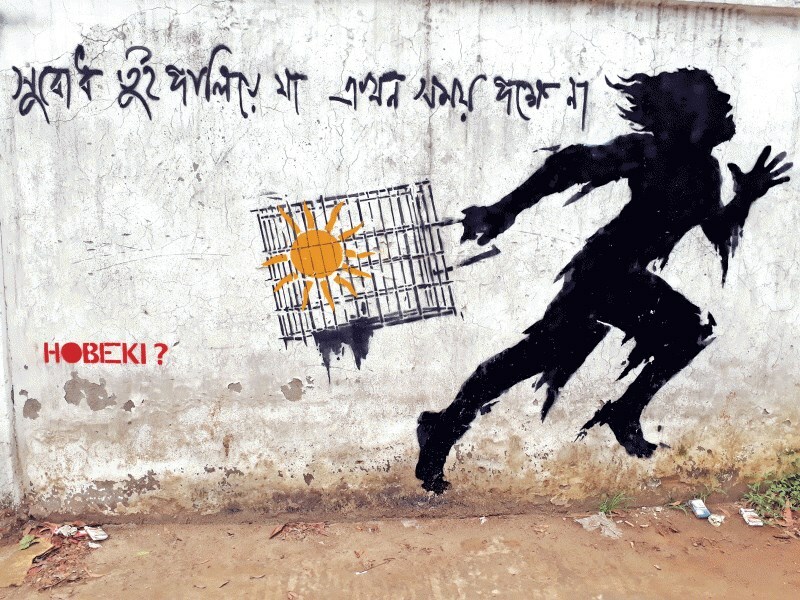 In the graffiti series, Shubodh is seen running away and while running away, he is carrying the glowing, blazing sun trapped in a cage, along with him. The sun here, is truth, energy and source of life. The artist mourns the ever decaying, ever rotting, sensitivity and thoughtfulness of our city and community. The artist urges Shubodh to run away as neither time nor luck is in his favor. In one graffiti, it is written that the thought of sin inhabits/paapbodh within people and shows shubodh/good-thinking/good-intent locked behind bars. The sign off often says hobe ki? – in the hope to turn things for better, to initiate and to step up to free the sun. This series is a by far the truest depiction of our collective lives and the most vivid reflection of our insensitive-vegetable-like state of mind, in pop art. –	my thoughts, my interpretation. you are free to think and entitled interpret the way you want to. Thanks for the excellent interpretation Sharmin. Thanks a lot for the apt and beautiful explanation. Should have been part of the article ! As I was going through the article the same interpretation popped in my head also. “Shubodh” = “Shubho Bodh” = Good-thoughts/intentions. I am quite sure it has nothing to do with religion. It would not be wise to comment and color SUBODH as the representative of any section or religions of the world nor even the name of any person.. To me ,’HOBEKI’ is the secret name of the Artist who may be a male or female and SHUBODH means Good,Honest or Holy Senses of every human beings of the world . Great Artist indeed also more powerful then banksy!